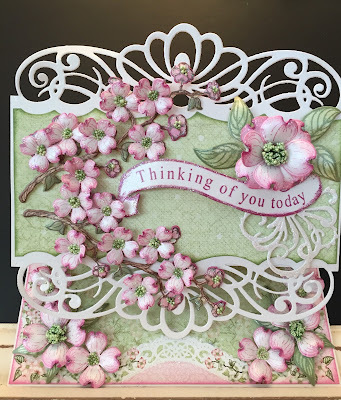 Just wanted to share a card I made for a dear friend with the Heartfelt Creations Flowering Dogwood Collection. I am in love with this gorgeous collection! 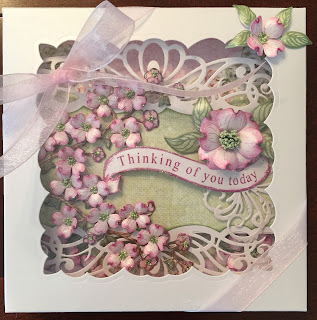 Card: Cut card base using White Pearl Metallic Cardstock6" x 10 1/2". Score at 6" and 9" and fold to form easel. Cut a 6" x 5 3/4" panel from the same card stock and die cut the top and bottom using the Regal Borders and Pockets Die. 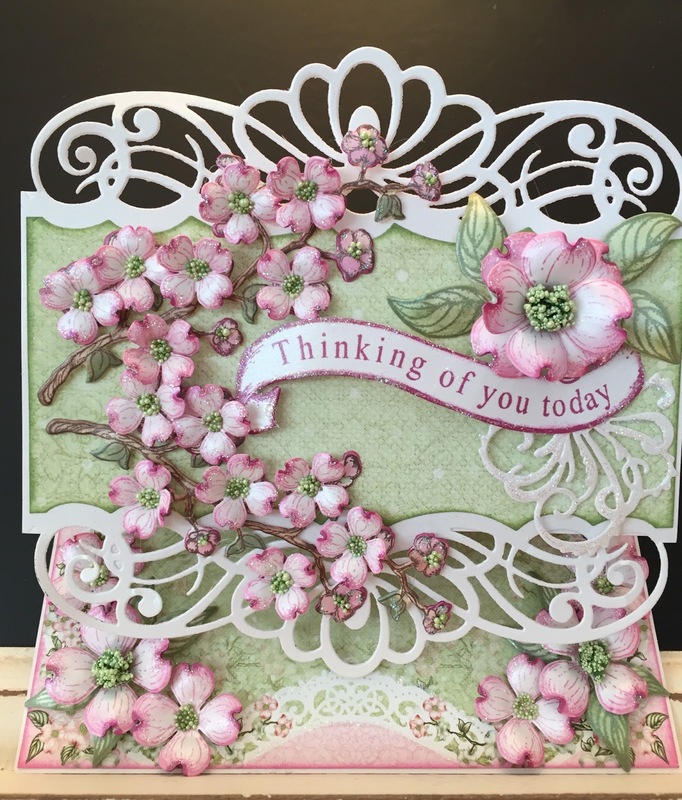 Cut a 3" x 5 3/4" panel from the Flowering Dogwood Paper Pad and cut using the edge Die from the Regal Borders and Pockets Die, ink the edges and attach to the panel using Dries Clear Glue. Attach this panel with the Regal Borders to the 1 1/2" section of the folded base using Dries Clear Glue. Cut two more 3" x 5 3/4 panels from the designer paper, ink edges and attach to the card. Cut a 6" panel from the designer paper and trim to 5 3/4" x 5 3/4", ink edges and attach to the card base. Stamp, color, cut and shape Flowering Dogwood Flowers and Leaves. Using green cardstock, cut and shape the stamens. Stamp the Flowering Dogwood Branches with Dark Brown Ink and color with Creamy Brown Ink. 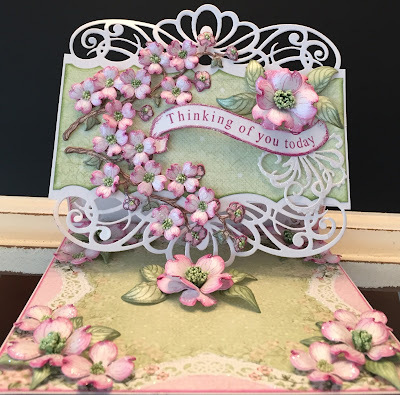 Stamp Thinking of You sentiment from Enchanted Dragonflies Stamp and Die cut with the matching die. Fussy cut to create simple banner. Color the edges. Cut doves from Flowering Dogwood & Doves Die and cut the tails to create flourishes. 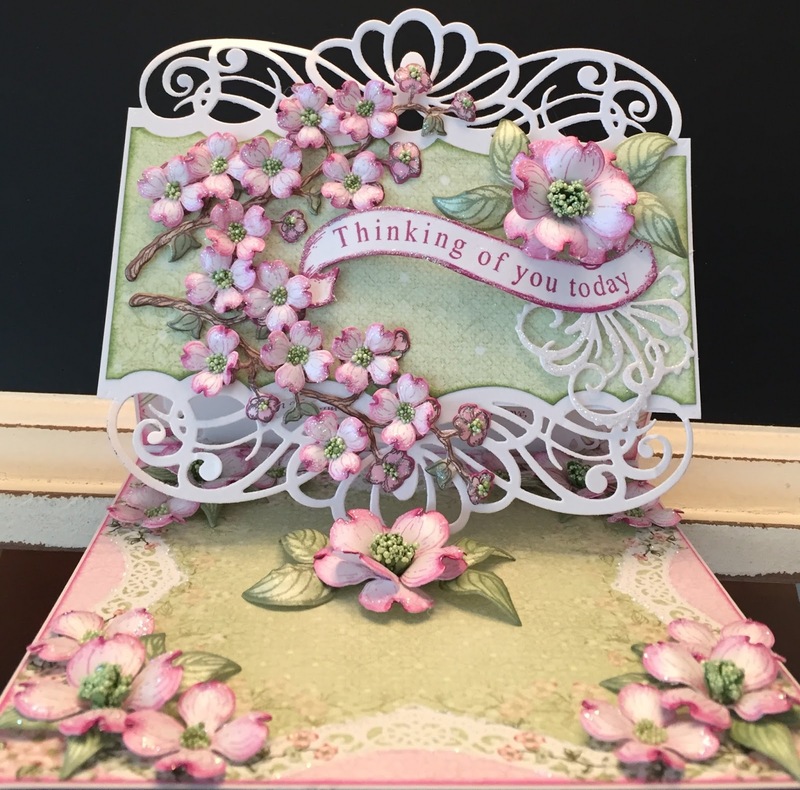 Decorate card base as shown and add lots of gorgeous glitter. Hope you liked this card and will visit again. WOW! This is absolutely breathtaking!!!! Those flowers are gorgeous! I have found the best post on a lot of pages and this is one of the few pages and websites that is thankfully save from those annoying ads.